" Professional model. Since 1925, Keilwerth has concerned itself with creating saxophones that allow the musician to shape his own sound and style. With this in mind, Keilwerth took the technical advantages and improvements of the SX 90, and added some extra features to truly make the musician‘s instrument his own. The result was the SX 90 R (the R standing for tonehole rings), a saxophone reminiscent of the old Conn and Buescher saxes of the 1940s. 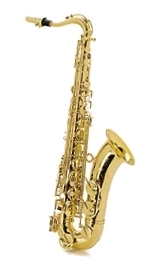 The most striking feature of this saxophone is its toneholes. The SX 90 R uses tonehole rings which are soldered on to the standard drawn toneholes. The tonehole rings give the pads a longer life, and the rings themselves are easier to replace if necessary, because they are a piece separate from the tonehole. The production of darker, more immediate, less focused sound is an added benefit of the tonehole rings, which allow the musican to form his own individual voice. Each saxophone is inspected by experienced professionals. Body mat nickel silver, black nickel plated, clear lacquered, silver plated keys, model "Shadow"